Photo for the Mirror by Chuck Meyers Hollidaysburg’s Brady Walters picks up some yardage while Altoona’s Devon Fagan pursues on Friday night. 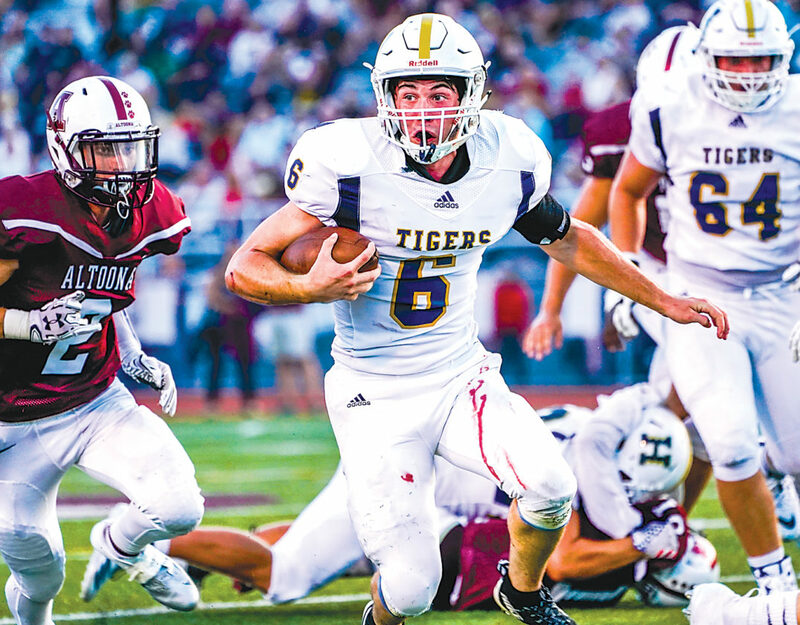 Hollidaysburg Area High School quarterback Brady Walters made a lot of plays on offense Friday night against Altoona, but the senior signal caller’s biggest play came on defense. With the game tied 14-14 late in the first half, Brock Irvin stripped Altoona quarterback Connor McCarthy. Walters picked up the loose ball in stride and raced 41 yards for a touchdown that gave Hollidaysburg a 21-14 halftime lead. The Golden Tigers scored the first two times they had the ball in the third quarter as well and went on to a 42-27 over the Mountain Lions at Mansion Park in the first meeting between the two teams since 2011. Austin Weakland returned the second-half kickoff 68 yards to set up Hollidaysburg coming out of the locker room. Three plays later, Walters connected with a leaping Jacob Sensenig in the front corner of the end zone for a 20-yard touchdown just 49 seconds into the third quarter. Following an Altoona punt, Hollidaysburg put together an 8-play, 65-yard scoring drive to take a 35-14 lead midway through the quarter. After Walters converted on 3rd-and-11 with a 25-yard completion, he found Bryce Martellacci for 16 more yards then scored on a 9-yard run. Walters finished with a game-high 133 yards rushing on 23 carries and completed 6-of-8 passes for 80 more yards. Nathan Fisher ran for 89 yards and three short scores for Hollidaysburg as well. “We have great guys up front. Those guys did a great job along with the H-backs and tight ends,” DeLattre said. After the teams exchanged touchdowns, Mitchell Lawhead took a screen pass 57 yards for Altoona to make it 42-27 with 1:05 left in the third. Hollidaysburg fumbled the ensuing kickoff, and Altoona recovered. The Mountain Lions moved the ball to the Hollidaysburg 4 but couldn’t punch it in. Jonah Brandt’s reverse pass to McCarthy out of the backfield on second down was just a little long, and McCarthy’s pass to Connor Adams in the front corner of the end zone fell incomplete on fourth down. Altoona started strong with Connor Adams taking a jet sweep 52 yards to the Hollidaysburg 10 on the Mountain Lions first play from scrimmage. Two plays later, McCarthy found Isaiah Barnes for a 9-yard score and a 7-0 lead 1:16 into the game. After Altoona held Hollidaysburg to a 3-and-out on its first possession, the Mountain Lions drove to the Golden Tigers’ 16, but McCarthy had a pass over the middle tipped and intercepted near the goal line by Jacob Sensenig. Sensenig returned the ball out to the Hollidaysburg 30. Fisher capped a 7-play, 70-yard drive with a 1-yard TD run to tie the game 7-7. McCarthy finished the game 26-of-37 for 242 yards and three touchdown passes. Adams had seven catches for 82 yards, and Lawhead grabbed eight balls covering 76 yards. Hollidaysburg (1-0) plays at Mifflin County next week. Altoona (0-1) hosts Williamsport in the second of four straight home games to open the season. A–Barnes 9 pass from McCarthy (Eisel kick), 10:44. H–Fisher 1 run (Pinter kick), 2:29. A–Day 6 run (Eisel kick), 5:44. H–Fisher 1 run (Pinter kick), 2:06. H–Walters 41 fumble return (Pinter kick). H–Sensenig 20 pass from Walters (Pinter kick), 11:11. H–Walters 9 run (Pinter kick), 6:28. A–Adams 38 pass from McCarthy (kick failed), 2:52. H–Fisher 3 run (Pinter kick), 1:52. A–Lawhead 57 pass from McCarthy (Eisel kick), 1:05. RUSHING–Hollidaysburg, Walters 23-133, Fisher 12-89, Barr 10-46, Weakland 1-10, Dellinger 1-0, TEAM 1-(-1). Altoona, Lawhead 14-49, Adams 3-41, McCarthy 8-23, Day 6-14, Barnes 1-13. PASSING–Hollidaysburg, Walters 6-8-0-80, Kratzer 0-0-0-0. Altoona, McCarthy 26-37-1-242, Day 1-1-0-6, Brandt 0-1-0-0. RECEIVING–Hollidaysburg, Martellacci 3-33, Moss 1-2, Sensenig 1-20, Weakland 1-25. Altoona, Barnes 7-35, Adams 7-82, Brandt 5-43, Lawhead 6-76, Shunk 2-12.